American Cat Con is one of the largest precious metals recyclers of spent catalyst and automobile catalytic converters and cores in Mississippi. We operate the facilitie and collection location in Gulfport, Mississippi, and several purchasing representatives throughout the United States. Converters are purchased nationwide and processed in the Gulfport, Mississippi location. There are several purchasing representatives throughout the United States. 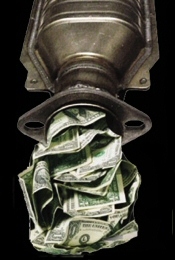 Turn your spent catalytic converters into cash! Come visit us today and get paid!